About my family's crazy ambitions. Letter Themes Part One: Letter U! For our third letter, we went for U. So much for skipping around the alphabet eh? Also, did you know, many of the words that start with the letter U are opposition words? As in unusual or unlikely? Take a peak in the dictionary, if you own one anymore (we don’t, sigh) and see how many pages ‘un’ goes on for. Umma Ungka’s Unusual Umbrella by Barbara deRubertis- In this animal antics story, Umma unfortunately feels unusual whenever the hot sun is beating down. Her uncle helps her out by giving her an unusual umbrella, that not only protects from the sun but is decorative and musical! Not only does Umma feel much better, all her classmates love the umbrella and come back to school the next day with their own creations. 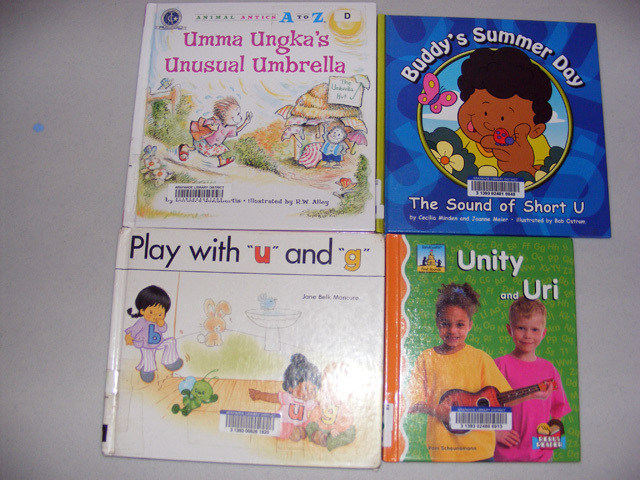 Buddy’s Summer Day The sound of Short U by Cecilia Minden- You know what is missing from the picture above? The book about the sound of long U. Oh, it is out there…somewhere. Just some genius of a mom forgot to request it from the library. It is called: Sue and the Music Show, the sound of long U, for those of you who are more organized. This simple story has one short sentence per page with an emphasis on short U words. Play with “u” and “g” by Jane Belk Moncure- Madness happens when u and g play with some adventurous characters (b, t, r, and pl). There is also other letters shown on the last page of the book that u and g also play with, d, j, m, etc. 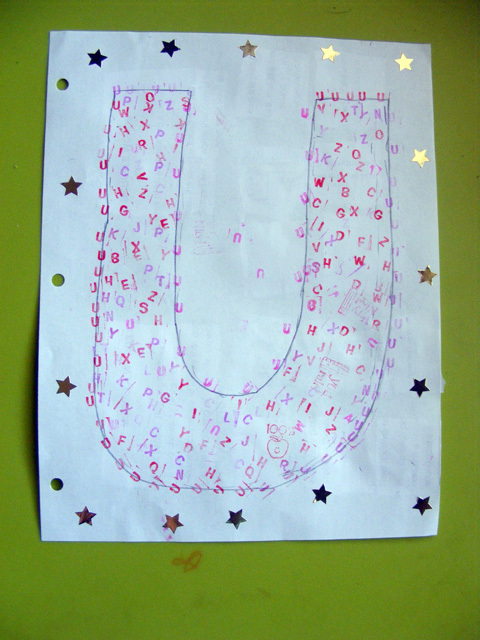 Unity and Uri by Pam Scheunemann- Unity and Uri help us discover more words that start with the letter U. This book starts with one word per page and moves on to using the introduced words together in simple sentences. Very nice learn to reader. 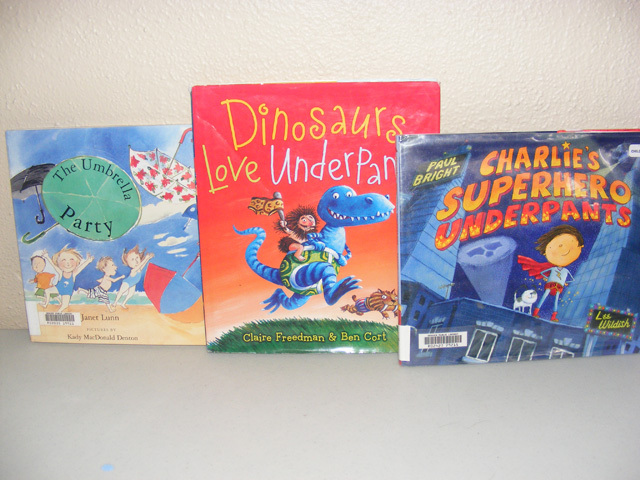 Yes, we have two underpants books…one we already had at our house, and the other well “super” is an example of a long u word and since we didn’t get the long U book…just kidding, we just really like underpants and think they are hilarious! 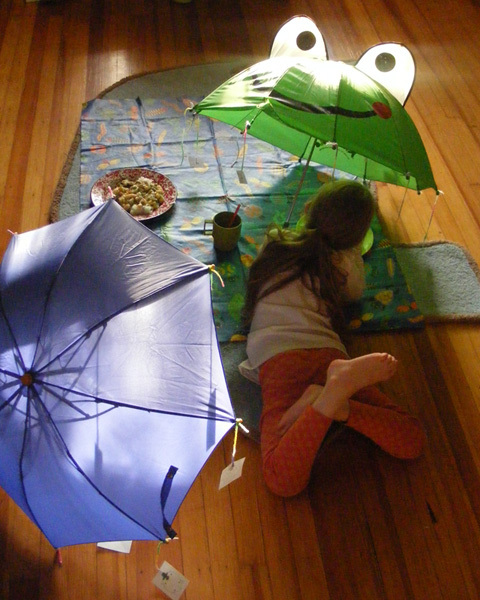 The Umbrella Party by Janet Lunn and Kady MacDonald Denton- When a little girl only thinks of, talks about and asks for umbrellas, umbrellas is all she gets at her birthday party. She is not upset though, she is the happiest ever. Though her friends find umbrellas boring, they find out how handy and helpful umbrellas can be when a storm comes to wreck the party. Dinosaurs Love Underpants by Claire Freedman- Our theories on dinosaur extinction are completely off. They really all died off fighting over underpants! They were so jealous of man-kinds knickers, that they stole and rioted to get their own pairs! In the end the great briefs war was too much for them. Charlie’s Superhero Underpants by Paul Bright- A giant gust of wind blows the laundry off the clothes line, in the laundry are some special items of Charlie’s family, included his own beloved underpants. Charlie goes on a search all over the world to find his underpants and finds them and an unlikely friend in a far off place. Adorable! (Apparently we had forgotten to do a regular ABC book this week. Oops! Well this is why this is only part one). For a letter U activity we went on a hunt for things we had around the house that started with U. 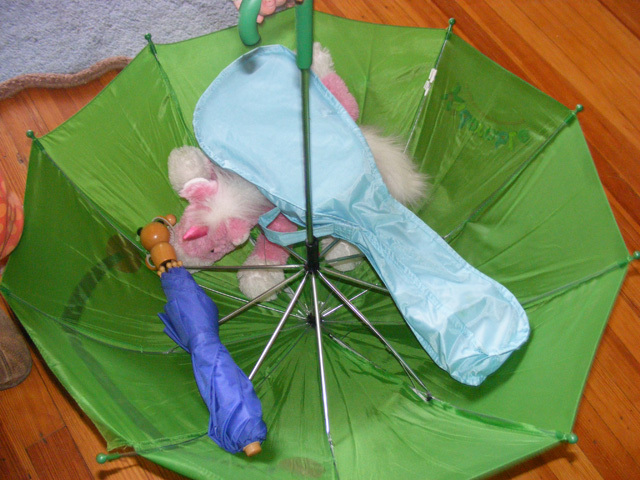 We came up with a couple of umbrellas, a herd of unicorns (only one pictured), a ukulele and underpants (not pictured). Never thought you would be able to see so many things that start with the letter U in one place! We also have a fun U lunch. We didn’t have any food in the house that started with U, so we went for food with the letter in them. Cucumber and bunnies. Mainly I just wanted to take a picture of the nice lunch set up. 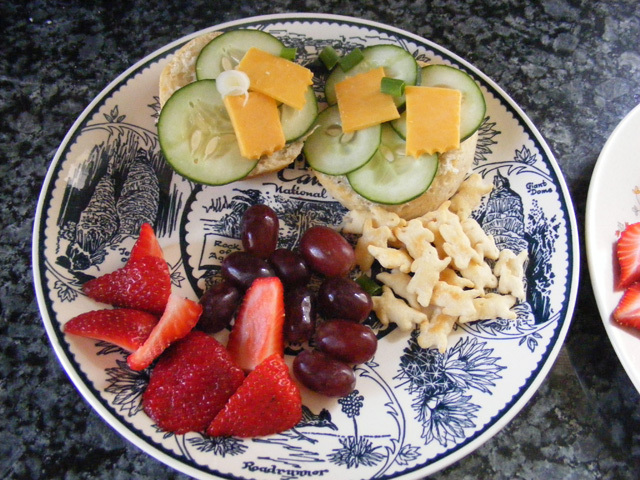 I am horrible at making lunch and fixing well balanced lunches. I was satisfied. The Umma Ungka work pages were wonderful. 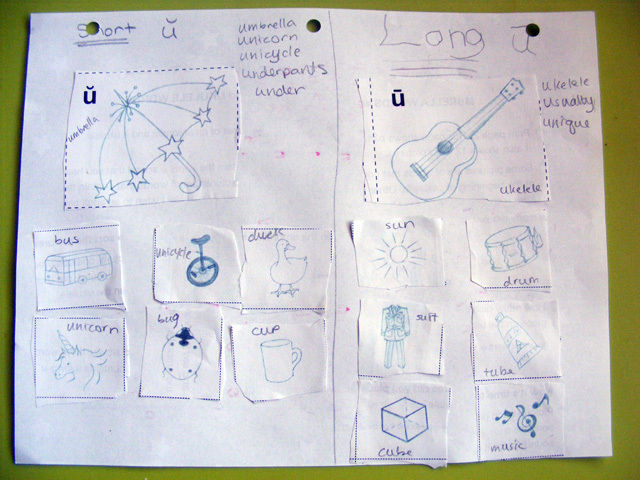 They had a long U/short U activity page, where you cut out the pictures and place them under the correct category, we also tried to list other words that we knew and wrote them in. Along with this, there was another cutting out activity. Lots of little squares had pictures, starting or containing the letter U. You cut out the squares, tape them to some string and tie them to your umbrella, to decorate it. Now you have an umbrella just like Ummas’. For our art portion we did stickers and stamps. Pretty fancy!! We ended the letter U with a trip to a local cafe that has umbrella in the name and an indoor/under umbrella picnic eating etouffee. (You can see our decorated umbrellas by the way). Welcome to the crayon apron! The blog that follows the crazy ambitions of myself and my family. Here you will find a plethora of topics, the main ones being; animals, sustainable living, knitting, sewing, reading, themed learning and endangered species. We do not home school, we supplemental school. While the snug my learn the basics at school, the point and goal of our themes is to instill a love of learning, creating and discovering, that will last for the rest of the snug's life. I'll let you know if this is a truly effective method in 30 years. As always, you know the blog laws, please link or cite if you need something from my blog.